The Special Night Event at the Kabukiza Theatre attracted a formally attired crowd of international and local visitors on October 27 to the highlight of TIFF’s Japanese Classics section. 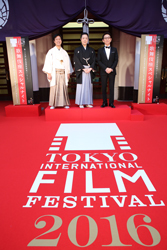 Marking the third year of the event, which TIFF cohosts with Shochiku at the historic theater in Higashi Ginza, this was to be the first time that a kabuki star would perform in an onnagata (female) role, and the first time that the event would also feature a Japanese benshi narrator during the film screening. After lamenting that only 8 percent of Japanese silent films are still extant, Furutachi launched into his narration of the six-minute 1910 Blood’s Up at Takata-no-Baba. The film is already so fast moving that it’s dangerous to blink; but with Furutachi cracking one hilarious line after another (“When he gets home, he finds a text message on his mobile…and goes into the kitchen to carbo load before running out of the house to participate in the Tokyo Marathon…”), the overall effect was stunning. Ichiro Kataoka then took to the stage, introducing the three musicians who would join him in creating the mesmerizing aural complement to the 1928 film Chushingura, directed by the “father of Japanese film,” Shozo Makino, and featuring Japan’s first movie star, Matsunosuke Onoe. The legendary tale of the 47 ronin who avenge their fallen master, the extraordinarily advanced film set the standard for all subsequent versions, with memorable scenes of the warriors captured in deep snow and a forest of pine. With Kataoka’s extraordinary vocal accompaniment and the propulsive musical score, the audience was transported back to old Edo. In previous years, TIFF’s special kabukiza night featured programs that focused on tachiyaku, or male roles. But in this male-only theatrical form, the onnagata actors are often the most heralded, and Onoe Kikunosuke is no exception. Acclaimed in Japan and elsewhere for kabuki and other roles, the actor’s appeal was apparent from the opening strains of his dance piece. The hugely popular “Sagi Musume” begins with a piercing melody and a light snow falling on a country scene. Suddenly, through the dusk, a maiden (Kikunosuke) in a pure white kimono arises from the frozen pond and begins dancing her sad tale of forbidden love. The spirit of a heron in human form, she has fallen in love with a man who later betrays her. In the blink of an eye, she changes her kimono and is suddenly in red, demonstrating the popular kabuki trick of hikinuki, when the top layer of kimono is pulled away to reveal the next. The maiden reminisces about meeting her love, and then, offstage, changes yet again, this time to a vibrant purple kimono. Dancing with hand gestures in a style called teodori, she laments the man’s coldness. Another quick costume change, into orange, and as the snow falls more heavily, she begins spinning her parasol in an agony of grief. One last hikinuki, and the maiden has transformed back into a white heron. She unfurls her wings in anguish and finally collapses into the snow. Almost as one, the audience burst into extended applause. Hoping the enchantment would last a little longer, they then lingered in front of the magically lit theater, before making their ways into the Tokyo night.